Jalopnik summed it up pretty well yesterday when they posted an article entitled "The Toyota Highlander Is Breeding Assholes" about the new ad campaign for the Highlander. It's a bit harsh, but it gets to the point and made me wonder if right now is the best time to be promoting obnoxious, stuck up children who look down on others in older cars. The premise of the ad is that a child does not want their parents picking them up from school in an old station wagon. It's embarrassing when a dad pulls up in a Buick Roadmaster while the Toyota family's child has a shiny new Highlander SUV to brag about. What Toyota forgets is that a Buick Roadmaster can be very cool. In fact, really cool in a fun car enthusiast way; hence, the headline slam from Jalopnik. What bothers me most about the ad is its timing. At time when frugal spending is in vogue, it is a bit counterproductive to insult families who are being sensible driving used, most likely paid off, cars. Though, I'm not surprised a car company is promoting buying a new car. Increasing used car sales or promoting keeping a car that is a decade plus old isn't good for business. Insulting frugal families isn't good marketing either. Did you upgrade to Disqus or did Blogger? I love Disqus! Anyway I agree with you Chris. But there is a HUGE reason for this angle. Notice after all the recalls Toyota can not use the reliable/quality angle. So they are trying something else. My folks just got their 3rd leased Highlander. A bit of a gas guzzler (19 city, 23 highway) and is good for the non-camping folks who need to haul dirt and mulch for their yard. The 3rd seat is ok. Better than the last version. But they got rid of the bench seat so now its a 4 seater vs a 5 seater. Requires assembly if you want a bench and the middle person is in a world of hate. Like they designed it for 2 and are punishing anyone who needs 3 to sit there. You have defined this Toyota Highlander with a very well format. I like your fruitful post too much. Its really one of the unique post by you. I did upgrade to Disqus. Should have done it years ago. It's such a better commenting tool. Don't get me wrong. I think the Highlander is a decent SUV (we own it's cousin the Lexus RX) and agree Toyota's attempt to push quality/safety hasn't resonated as much as they want it to. I just think taking a swipe at frugality is a bit misplaced in the current economic environment. I didn't like the Highlander much. 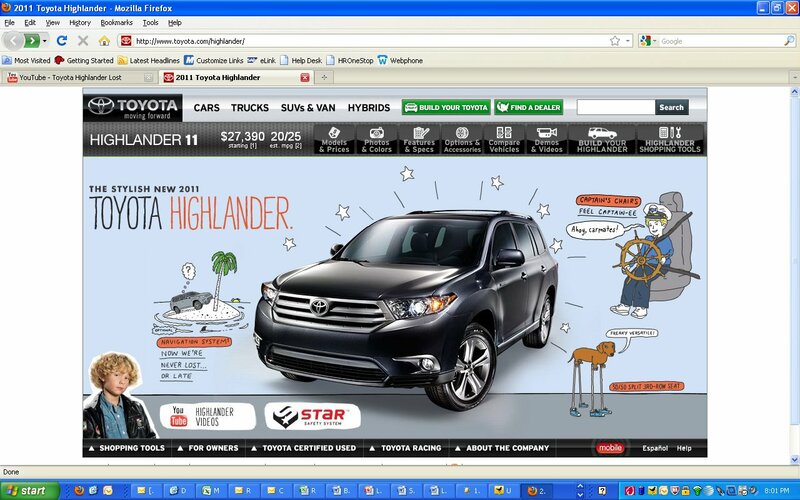 There are much more better SUV's than Highlander and according to the standards of Toyota Highlander is quite normal. In my opinion, "breeding assholes" is a bit too harsh. After all, these cars have been doing all sorts of ad campaigns for decades. Why complain now? And even if we do complain, there is no proof that ads like these have created bad people.